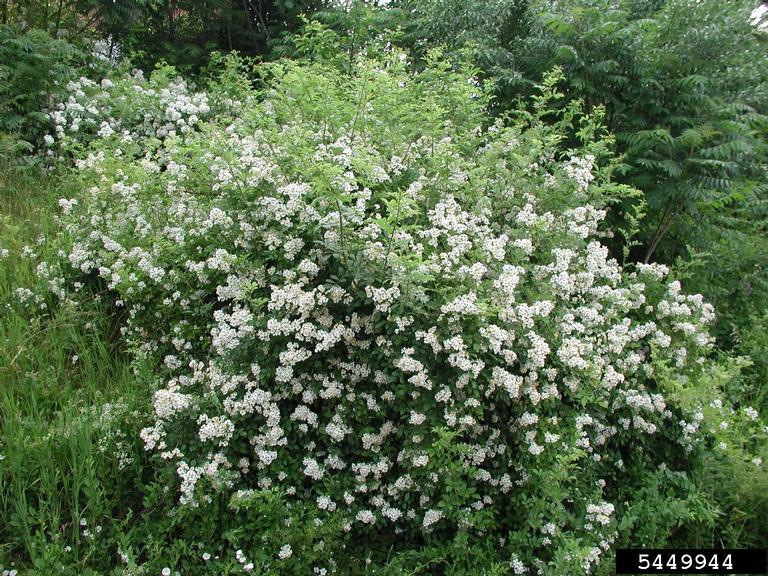 Description: Multiflora rose is a thorny shrub with arching stems. It produces clusters of pale white flowers in late spring. A key feature for identification is the presence of fringed or feathery stipules at the base of the leaf stalk. Lovely clusters of fragrant white blossoms appear in early summer. Small red fruits (rose hips) develop during the summer and remain on the plant through the winter. The base of multiflora rose leaf stalks have fringed or feathery stipules. The stipules on multiflora rose might be less obvious on some plants. Deeply recurved prickles on young green stems are diagnostic for multiflora rose. 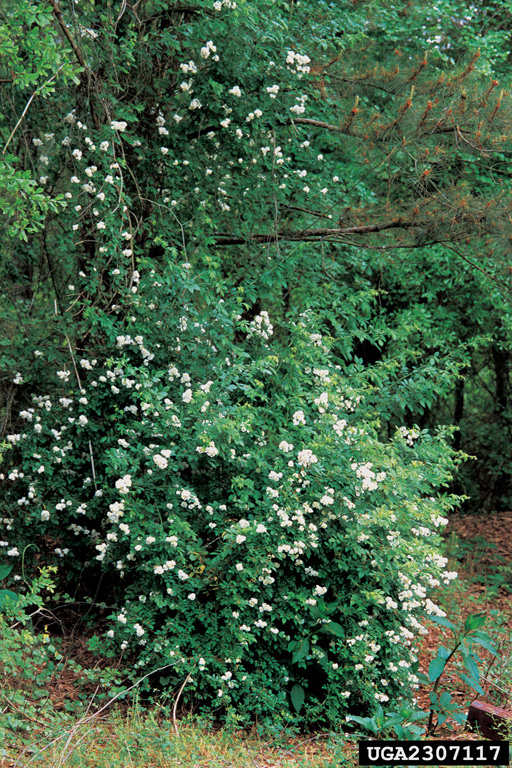 Habitat: Multiflora rose will grow in sunny to semi-shaded habitats with well-drained soils. Although not a vine, multiflora rose can climb into adjacent trees. Invasive Traits: Shrubs produce prolific amounts of fruits, which are attractive to birds, which are the primary dispersers. Root sprouts travel horizontally and produce new sprouts. Control: Hand pulling or digging can be effective for small populations as long as root systems are removed. Repeated mowing or burning can temporarily control growth. Herbicide application is most effective when cut stem or foliar spray methods are used.